to protect the pearl fishers. 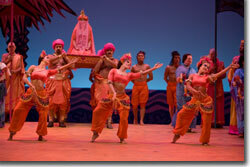 European opera has always celebrated the exotic, wherever it may be found, and in The Pearl Fishers, set in pre-colonized Ceylon (Sri Lanka), Georges Bizet has certainly found fresh, unplumbed material. In Opera Colorado's first-ever production of this much requested chestnut, the far-flung locale and mysterious rituals are pushed to the fore by the pleasures of Zandara Rhodes' eye-popping scenery and costumes, John Malashock's evocative choreography, Sebastian Lang-Lessing's bright baton, and, above all, four wonderful voices, topped off by the natural, dramatic work that stage director Andrew Sinclair's elicits from the singers. Nadir and Zurga swear eternal friendship. From the top, Brian Mulligan's robust baritone and Sean Panikkar's well-rounded tenor show us that we're in for a special evening, an impression punctuated by the Act I famous duet between Nadir and Zurga ("Au fond du temple sainte"). 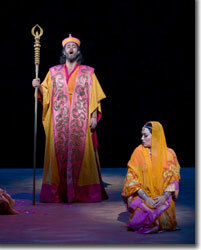 David Cushing's commanding bass makes for an imposing Nourabad, the high priest. On opening night Heidi Stober was ill, which gave us the opportunity to enjoy Mary Dunleavy, who recently made her debut with the Seattle Opera in the roel of Leíla, the priestess; she wowed us with her sweet, clear soprano. Bizet's youthful, heroic idealism (he was only 24 when he wrote this) shines through, much as it does in the 28-year old Mozart's The Magic Flute, with the young couple, Nadir and Leíla, overcoming a variety of life-threatening trials before beginning their life together. 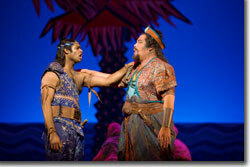 Opera Colorado's production of The Pearl Fishers has two remaining performances, Friday, February 20th, at 7:30 pm and Sunday, February 22nd, at 2 pm. Call Ticketmaster at 303-357-ARTS or visit www.operacolorado.org.